Carpal tunnel syndrome (CTS) is a common condition of the wrist and hand that can affect the use of the whole arm. It is caused by pressure on the nerve at the base of the palm (median nerve). Because of the demands that people place on their hands and wrists, CTS is a common condition affecting 1 out of 20 Americans. Surgery for this condition is commonly performed on the wrist and hand. Fortunately for most people who develop CTS, physical therapy treatment can often relieve pain and numbness and restore normal use of the hand, wrist, and arm without the need for surgery. About the width of your thumb, the carpal tunnel is a narrow channel on the palm side of your wrist. 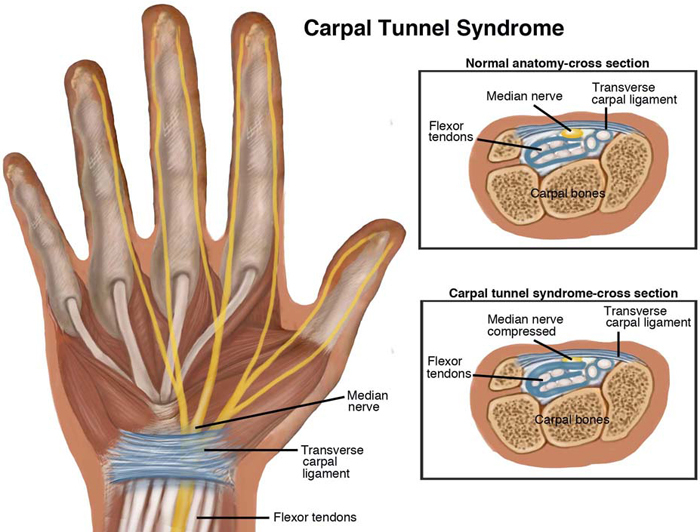 The tunnel protects the median nerve and the tendons that bend your fingers. Pressure on the nerve can cause pain and weakness in your wrist and hand and numbness or tingling in some of your fingers. This pressure is caused by crowding or irritation of the median nerve in the carpal tunnel and can lead to CTS. Extreme wrist positions, as well as a lot of finger use, especially with a lot of force or vibration (such as holding the steering wheel when driving heavy machinery), can all contribute to CTS. CTS is common in professions such as assembly-line work, particularly meat packing; and jobs requiring the use of hand tools, especially tools that vibrate. Although excessive keyboard and computer use is often associated with CTS, those performing assembly line work are 3 times more likely to develop CTS than those who perform data entry work. Some leisure activities can also create CTS, such as sewing, sports such as racquetball and handball, and playing string instruments such as the violin. CTS usually starts gradually, with symptoms such as burning, tingling, "pins and needles," or numbness in the palm of the hand and fingers. Often the symptoms are more noticeable during the night, and individuals often report being wakened with symptoms. Many people feel the need to "shake out" their hands to try to relieve the symptoms. As the condition progresses, the symptoms are noticed during the daytime and are often worse when holding items such as a heavy book or a hairbrush. Weakness of the hand and more constant numbness may occur if the pressure on the nerve continues. You may find that you drop objects unexpectedly or have a weakness in your grip. Physical therapists work closely with other health care professionals to accurately diagnose and treat CTS. Symptoms of CTS are typical, and it is often possible to diagnose it without extensive testing. Physical therapists are experts in the movement and function of the body and will conduct an evaluation to determine all of the factors that may be contributing to your condition. Examination of your neck and entire upper extremity to rule out other conditions. Many patients have been told they have CTS, only to find out that the pain is coming from another body area. Wrist flexion (Phalen) test: Your physical therapist will have you push the backs of your hands together for 1 minute. Tingling or numbness in your fingers that occurs within 60 seconds may be an indication of CTS. Tinel's Sign: Your physical therapist will use a reflex hammer or finger to tap over the median nerve at your wrist. Tingling in the thumb and index and middle fingers may indicate CTS. Electrical studies (electromyogram/EMG) and nerve conduction velocity (NCV): These tests determine the transmission of the nerve and the severity of the CTS. X-rays: When trauma has occurred or if there is reason to suspect anatomical abnormality, x-rays may be ordered. In some cases, your physical therapist may refer you to a physician or other health care professional for additional testing or treatment. After the evaluation, your physical therapist will prescribe your treatment plan based on your specific case. If your evaluation confirms early-stage CTS, conservative care will be recommended as a first step. Physical therapy treatment can be effective in reducing your symptoms and getting you back to performing normal activities. During your first visit with the physical therapist, be prepared to describe your symptoms in as much detail as possible, and say what makes your symptoms worse. A worksite visit to assess your work area. For example, if you sit at a desk and work on a computer, it's important for the keyboard to be in proper alignment to help avoid working in a bent wrist position. Your physical therapist will also consider your home and leisure activities, with recommendations such as wearing gloves to keep the wrist/hands warm and limiting sports that aggravate the condition, such as racquet sports, until symptoms resolve. The goals of physical therapy are to reduce your symptoms without the need for surgery, to enable you to be as active and functional as possible, and to help you resume your normal work, home, and leisure activities. There are no proven strategies for preventing CTS, but there are ways to minimize stress to your hands and wrists. Since there are contributing factors to developing CTS, one single solution may not be effective. Reduce force. Most people use more force than needed when performing work with their hands. Relax your grip to avoid muscle fatigue and strain. For prolonged handwriting, use a larger-handle pen or soft gel grip. Take frequent breaks. When doing repeated activities, give your hands a break by performing stretching exercises once in a while. If possible, alternate your hands when completing some tasks. Neutral wrist position. Avoid bending your wrists by keeping them in a straight or “neutral” position. This means your wrist should not be bent up (extended) or down (flexed). Work area adjustment. Have a physical therapist examine your work area to make sure it fits your height, posture, and the tasks required. Simple adjustments can help avoid unnecessary strain. Improve your posture. Make sure your posture is appropriate to the task you are performing. Believe it or not, proper alignment of your trunk, neck, and shoulders can prevent excessive strain and improper positioning of the wrists and hands. Keep your hands warm. You are more likely to develop hand pain and stiffness if you work in a cold environment. If you can't control the temperature, be sure to wear gloves to keep your hands and wrists warm. Maintain good health. Paying attention to your general health is an important step in preventing CTS. Staying physically fit and maintaining a healthy weight may help control diseases and conditions that may contribute to the onset of CTS. Claudia is a 42-year-old woman who works in a meat packing plant. Her job involves taking meat off of the vibrating conveyor belt, and packing it into containers. Claudia had worked for the company for just over a year when she began to experience numbness and pain in her right thumb and index and middle finger. Her pain is worse at night and interrupts her sleep. Her hand feels weak and swollen, and she has begun to drop things. Claudia has read about potential causes of pain and numbness in the hand on the Internet and is afraid she will need surgery. It took her months to find this job after being laid off from her last job. She is afraid of losing her job if she mentions her symptoms and can't afford to miss work. Her neighbor suggests she see someone for her problem. She then makes an appointment to see a physical therapist. The therapist asks about Claudia's health history, which includes diabetes, inquires about her current job demands, and performs a thorough evaluation. The therapist evaluates the mobility and strength in Claudia’s right hand, wrist, and arm. Her strength is slightly decreased in the affected hand and wrist. The results of the Tinel and Phalen tests bring on her symptoms. Strengthening exercises using small foam balls and exercise putty to increase the strength of hand muscles. Exercise putty is a material, similar to children’s putty, used to strengthen the fingers and hand. Claudia's employer agrees to a worksite visit by the physical therapist. Although the packer station allows both the right and left hand to be used, Claudia had only been using her right hand. The therapist recommends Claudia alternate hands to give the right hand a rest. She also shows Claudia how to position her body to avoid the need for excessive reaching and pulling, and how to keep her wrist in a neutral position when pulling. Last, she instructs Claudia in stretches to use between work activities. This story is based on a real-life case. Your case may be different. Your physical therapist will tailor a treatment program for your specific case. A physical therapist who is experienced in treating people with arm and hand musculoskeletal disorders and one who has experience in ergonomics and work site evaluations. Ergonomics involves understanding the fit between a user (the person), the equipment, and the environment. A physical therapist who is a certified hand therapist (CHT). A physical therapist who is a board-certified clinical specialist or who has completed a residency or fellowship in orthopedic physical therapy. This therapist has advanced knowledge, experience, and skills that may apply to your condition. When you contact a physical therapy clinic for an appointment, ask about the physical therapist’s experience in helping people with CTS. The following articles provide some of the best scientific evidence related to physical therapy treatment of CTS. The articles report recent research and give an overview of the standards of practice both in the United States and internationally. The article titles are linked either to a PubMed* abstract of the article or to free access of the full article, so that you can read it or print out a copy to bring with you to your health care provider. Carpal tunnel syndrome fact sheet. National Institute of Neurological Disorders and Stroke.. Updated September 16, 2011. Mayo Clinic. Carpal tunnel syndrome. Updated February 22, 2011. LeBlanc KE, Cestia W. Carpal tunnel syndrome. Am Fam Physician. 2011;83:952-958. Article Summary on PubMed. Groth GN. Predicting intentions to use research evidence for carpal tunnel syndrome treatment decisions among certified hand therapists.J Occup Rehabil. 2011;21:559-572. Article Summary on PubMed. Keith MW, Masear V, Chung KC, et al. American Academy of Orthopaedic Surgeons Clinical Practice Guideline on diagnosis of carpal tunnel syndrome. J Bone Joint Surg Am. 2009;91:2478-2479. Article Summary on PubMed. Jarvik JG, Comstock BA, Kliot M, et al. Surgery versus non-surgical therapy for carpal tunnel syndrome: a randomised parallel-group trial. Lancet. 2009;374:1074-1081. Article Summary on PubMed. American Academy of Orthopaedic Surgeons. Clinical practice guideline on the diagnosis of carpal tunnel syndrome. Published May 2007. O'Connor D, Marshall S, Massy-Westropp N. Non-surgical treatment (other than steroid injection) for carpal tunnel syndrome. Cochrane Database Syst Rev.2003;(1):CD003219. Article Summary on PubMed. Authored byp Margot Miller, PT. Reviewed by the MoveForwardPT.com editorial board.